Doncaster Knights director of rugby Clive Griffiths thinks the top four in the Championship is all but decided. Bristol, Knights, Yorkshire Carnegie and Bedford currently occupy the four promotion play-off spots. 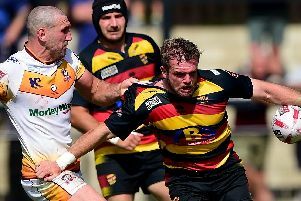 “I think the top four is probably decided,” Griffiths said after skipper Michael Hills’ last-minute match-winning try against Carnegie at Castle Park on Saturday. “We saw on Saturday that Yorkshire Carnegie are a good side and Bedford had been on a good run before losing to Jersey at the weekend. “It will certainly take a massive effort for either Jersey or Nottingham to get into the top four with only six games left. “I know you can never say never but the only thing which can realistically affect our chances now is a glut of injuries. “We’ve picked up a few in the last couple of weeks what with Sam Edgerley, who gave us cover in the backs, ruled out for the season and Dougie Flockhart needing an operation to repair a torn bicep. “It’s obviously a big blow losing Dougie, he’s the best goal kicker in the league and has been playing well. “It’s difficult to put a time on how long he’ll be out for but it could be over six weeks. Doncaster’s win on Saturday means that they have now beaten ten of their 11 Championship rivals this season. Only London Welsh stand in the way of Knights’ first-ever clean sweep of Championship clubs. Analysing last weekend’s game confirmed the Welshman’s post-match view that the two sides had given the bumper derby crowd full value for money. “Even if we had lost the game I’d have still looked back on it and said over 2,300 people were royally entertained on the day and hopefully will come back to watch us again,” he said.